John Battelle's Search Blog We Are (About to Be) As Gods. Can We Get Used To It? We Are (About to Be) As Gods. Can We Get Used To It? Last month I finished another of my “must read” books – Regenesis: How Synthetic Biology Will Reinvent Nature and Ourselves, by George Church and Ed Regis. While the authors don’t veer into the religious, a reader can’t help but ponder the unknown and the supernatural – because the book rather calmly takes a fair amount of what we take for granted as pre-determined in our lives – disease, death, the nature of how things become what they are – and without too much fanfare, declares them soluble. 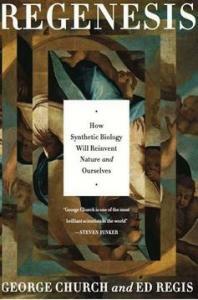 Church is a highly regarded geneticist with dozens of innovations to his credit, Regis is a talented science writer. Church provides the book’s voice, authority, and personal anecdotes, Regis its structure and rigor. The combination works, though the first few chapters are a bit rough if your high school chemistry is rusty. Each time I returned to it, I found myself enjoying Regenesis, and I can’t say that for many non-fiction books I’ve read lately. The appearance of DNA some 3,900 million years ago makes it the most ancient of all ancient texts. …we stand at the door of manipulating genomes in a way that reflects the progress of evolutionary history: starting with the simplest organisms and ending, most portentously, by being able to alter our own genetic makeup. But the impact of synthetic biology doesn’t stop there. Leveraging tools now in early stages in labs and for-profit companies around the world, we soon will be able to harness what we understand to be the very laws of nature – for example, the forces which conspire to turn an oak seed into a mighty tree. If we understand DNA and its expression entirely, then why can’t we program a seed that “grows” into a house? Or create swarms of bacteria that convert waste into clean energies? Or reprogram our DNA such that we never suffer from a viral disease? In 1980 commercial DNA synthesis services were available, at the going rate of $6,000 for a small amount of product, only about ten nucleotides long. They were used either to find valuable genes in cellular RNA or to synthesize them. By 2010 we could make a million 60-nucleotide oligos for $500. Just as the global appetite for reading DNA seems insatiable—growing a million-fold in six years and still increasing—the appetite for DNA synthesis, or “writing,” will probably grow similarly and go in many unexpected directions. For Church and Regis (and many others in the field), this is where the practice of engineering comes in. When the digital world exploded onto the scene in the mid 20th century, engineering wrestled it to the ground and helped us create extraordinary new things like computers and the Internet (and all their attendant applications), all based on having cheap, mass produced components like CPUs, hard drives, monitors, and the like. Biology has been stuck in a “pre-digital” age for much of the past century, but is about to burst forth as the strictures of engineering are applied. “Engineers normally had access to an ordered supply of well-defined, interchangeable, off-the-shelf parts, specification sheets, system plans, and so on,” the authors write. Until recently, such tools were not available to those who wished to construct life. That, the authors argue, is about to change. (Church even goes so far as to encode his book – billions of times over – into DNA. Quite a parlor trick. You can read more about that here). The book goes into far more than I’ve touched upon here. At times it preaches, or is flip, or dismissive of potential risk or counter-argument. But overall, this is an important work, one that introduces the basic elements for a debate I believe we’ll be having as society for the next few decades, if not longer. Because let’s face it, we’re not going to stop futzing with DNA, or computers, are we? So as Stewart Brand famously declared: We better get good at it. The Corporation (film – review). Coming up: City of Golden Shadow (Otherland, Volume 1). I’ll be picking this up. You also remind me that I need to read on a broader array of topics. Thanks. great post, this is on my reading list. barring social apocalypse, this is our future. that being the case, I do wonder if our political and social institutions can handle this kind of power, it’s like strapping a Falcon 9 rocket on your back and hoping you’ll end up on the moon – alive. We’re struggling to solve the problems of the day from global warming to gun violence. Rational, reasoned debate…. ugh, not so much. And if Church and Venter and Kurzweil and all the others are right, or mostly right (and I think they are), then we’re going to have a Falcon 9 rocket strapped to our back in 15-25 years. We better learn how to control that thing. Which is why Stuart Brand revised his original dictum from, “we are as gods and might as well get good at it.” to, “we are as gods and HAVE to get good at it.” Now is the time. but what —- exactly —– does it mean to get good at it? We need leadership, perhaps in the form a Russell-Einstein Manifesto for our era. But I can’t think of a single scientist or intellectual who rises to the level of Einstein (or Russell), someone whose words could cut through the confusion and partisanship and catalyze a new consensus. And we need new institutions of social decision making. New ways to support the Article 21, Section 3 of the Universal Declaration of Human Right – “the will of the people shall be the basis of the authority of government.” Only 11% of the world population lives in a “full democracy.” 2.6B are under authoritarian rule. Democracy, in a new form, not the jaundiced version that we have in the US, is needed. In part because Regenesis raises foundational issues of equity. How will this bounty – genetic (re)engineering, extended/indefinite life, etc… be distributed? There’s a fundamental difference between porsches only being accessible by the wealthy and death only being an issue for the poor. We need to decide, together, how to cope with the coming abundance. Very well put Christopher, thank you. Previous Previous post: Phones! Now With Multitasking! Why Mobile Is About To Have Its Web Revolution.